Thousands of years before books were contained within a hand-held technological tablet or phone, there were cuneiform tablets no bigger than the size of a quarter. 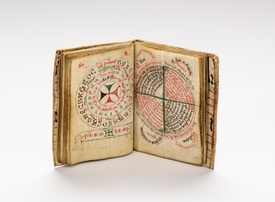 On view through May 19, 2019 in the second floor gallery of the Grolier Club are 275 rare diminutive texts and bindings from around the world that have been created over the span of 4,500 years. Size matters: these tiny tomes range in size from a maximum of four inches to less than one millimeter. Drawn from the collection of Patricia J. Pistner, the exhibition represents the history of the book in miniature form. The exhibition is selected and organized by Pistner, along with Jan Storm van Leeuwen, former keeper of rare bindings at the Royal Library in The Hague and winner of the ILAB Breslauer Prize for Bibliography for his important study Dutch Decorated Binding in the 18th Century. Hyakumantō-darani. Nara, Japan: c. 764–770 CE. Among the oldest block printed texts, housed in its original wooden pagoda.